Resist Those Dancing Bunnies - Ask Leo! All the anti-malware software in the world can't protect you from yourself if you're intent on bypassing them to see the dancing bunnies you've been promised. There are those who believe that anti-malware applications actually aren’t needed. While I disagree with that as an absolute statement, the fact is that if you really know what you’re doing – deeply – then it may be possible to be relatively safe on your own. It’s just not something I advise, since it relies on being 100% right 100% of the time when it comes to identifying and avoiding potential threats. Things have become much too complex to rely on that kind of accuracy. The real problem, however, is that even with those tools in place there’s really no way to avoid what’s called the “Dancing Bunnies” Problem1. 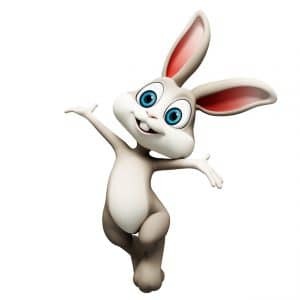 It works like this: if typical users receive an email that says, “Click here to see dancing bunnies”, then a significant number of them are going to circumvent any and every protection the system might have in place, because they want to see those dancing bunnies, dammit. That’s the heart of what’s been called social engineering – promise something you know people will react to to get them to bypass the security measures in place; so as to allow whatever else you really had in mind. At that point, it doesn’t matter what the ideal operating system is or even what the best anti-malware tool is. We’ve all seen or heard of users who very carefully and determinedly dismiss, ignore or otherwise bypass every warning and every roadblock that’s been put in place to keep them safe, simply to see those dancing bunnies. Pay attention to what your security tools and measures are telling you. If your anti-malware tools throw up a warning, then STOP. Yes, it could be a false positive, though most often it’s not. It could be an annoyance, but it’s an annoyance meant to keep you safe. Do some research before you proceed. Read the messages that your anti-malware tool is giving you, as well as any additional information it offers. Search the internet to see what others’ experiences have been in your situation. Ask a trusted adviser. Get more information before proceeding. The anti-malware or other tools are warning you for a reason. Remember, once your machine has been compromised by malware, it’s not your machine any more. Once your account has been hacked into, it’s not your account any more. The cost of failure in scenarios like this can be very, very high. And it’s extremely likely that there simply are no dancing bunnies at all, no matter what you’ve been promised. The best anti-spyware, anti-virus … and dancing bunnies? - The best operating system in the world can't save you from dancing bunnies. Is anti-virus dead? - Anti-malware tools have never been 100% solutions - but, despite what we hear on the news, they are far from dead! Why Don’t Anti-malware Tools Work Better? - It's possible to get malware, even with anti-malware tools installed. Why the heck is that true? Why didn’t my firewall stop this malware? - Firewalls and security software are important tools to keep your computer safe. Unfortunately, there's no such thing as perfect protection from the variety of threats on the internet. 1: Larry Osterman, a Long time Microsoft developer who started there a year after I did, posted some years ago discussing dancing bunnies. Excellent article! I couldn’t agree more, and I like the title – it fits so well. Of the many friend’s computers that I get to put back on track, the “Dancing Bunnies” likely caused 90% of the problems. This is so true. There is no software in the world that can protect people from their own stubborn stupidity. I have a customer whose computer keeps getting infected. He knows where it’s happening. Certain adult websites he visits. However, he won’t stop visiting those websites, even though he knows what is going to happen to his computer when he goes there. He just won’t. His argument is that there should be software that will allow him to visit bad websites safely. Last time I checked, no one had yet perfected a condom for a computer. He keeps getting stung by these websites, but persists in going back. Makes no sense to me. I collect a check, though, every time he brings one of his laptops in to be cleaned up agaon. Sandboxing comes pretty close to a condom. Have you considered that continuing to fix his computer in this situation makes you an enabler? He keeps visiting those sites with the comfort that you’re there to rescue without fail. You did not include a link to the dancing bunnies. At least I included a picture. There’s only one. We want MORE dancing bunnies. Those large share buttons that pop up on top of the text of this and other articles are annoying. Why not a bar at the top of the page? You can easily shrink them. Just mouse over and click the little left arrow that shows up at the bottom. Works great. Yes, but it’s annoying to have to do it on every article. If I haven’t read the article, how do I know if I want to share it? In another article, Leo says that if the advertising annoys us, we should tell the advertiser by not visiting their site. Does that mean Leo wants me to leave/unsubscribe? Actually, I notice that today there is a wider margin on the left side and the buttons fit in the margin, so the text is not hidden. That is a satisfactory compromise for me. So keep the margin and I’m happy. I adjusted the margin due to the complaints. Nowadays I find some websites (I mean the decent ones, and not the…!) displaying adds ‘You’ve won… Not a Joke..’ As I’m afraid clicking those ads, I want to know about them safely from you! If it sounds too good to be true, it’s probably not true. Most sites – including Ask Leo! – have only limited control over the ads that are displayed.